I RECEIVED a fair amount of criticism from my friends in the west a couple of weeks back after comments I made on RTé in relation to Galway's ambitions for this year. 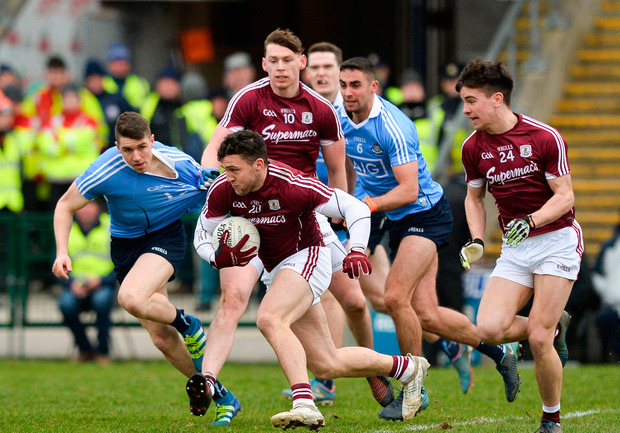 My comments centred around the perceived benefits or otherwise of Galway qualifying for the National Football League final, something that they have managed to do with a fair degree of comfort. To arrive up from Division 2 and pick up 13 points from a possible 14 is a wonderful testament to their efforts this spring and they deservedly take their chance in Croke Park on Sunday as they were the most consistent of all the counties in the top tier. I have been consistently complimentary about the progress they have made and there was a degree of misinterpretation in terms of what I said in relation to their development as a whole. All I questioned was the wisdom of Galway making the final when their biggest game of the year (the Connacht Championship opener against Mayo, May 13, Castlebar) was on the not-too-distant horizon. It's evident by the nature of the championship structure this year that whoever loses that fixture will have an incredibly difficult task in retaining momentum and surviving all the way through to the Super 8s. This is the reason I feel that making Sunday's final could be detrimental to Galway in the long run, irrespective of the result. With the greatest respect to them, Galway have had difficulties in Croke Park on their recent visits there and some dispiriting defeats at the hands of Kerry and Tipperary in the past couple of years were especially difficult to take, given the manner in which they played. That makes their renaissance this year all the more impressive and Kevin Walsh deserves great credit in making the Tribesmen a viable challenger, coming from such a low ebb. Given the quality of some of their forwards like Damien Comer, Shane Walsh and Eamonn Brannigan, there have been calls for Kevin Walsh to adopt a less cautious approach and utilise the talents of the aforementioned trio et al. However, I don't feel that they are ready for that at present and in my opinion, they aren't just good enough at this moment in time to favour an expansive approach against a team as talented and experienced as this current Dublin team. I think that they have done the right thing in concentrating on the fundamentals of making themselves difficult to break down but I still feel that Sunday will be a massive test for them purely because of Dublin's familiarity in overcoming this system. Of course, if Dublin play without the desired intensity, as was the case against Monaghan last weekend, then Galway have a great chance but I expect a far more committed and explosive Dublin today. In the broader scheme of things, this is a good test of where Dublin are and while some fringe players tested last week didn't really cover themselves in glory, I think we'll see a more seasoned Dublin selection for the final. There's no way that Jim Gavin will be happy with that defeat - and that's two matches on the bounce that Dublin have failed to win. He'll be determined that the aura of successful teams, normally attributed to the likes of the All Blacks and Barcelona, returns and his team will be reloaded as a result. The expected return of Ciarán Kilkenny is vital in that regard as he is the linchpin of the attack and everything positive that Dublin do generally revolves around the Castleknock player. He has become a leader of this team and I would anticipate that the likes of Jonny Cooper and Stephen Cluxton, players with serious leadership qualities, will also come back to give Dublin a better balance. Dublin's team selection will reflect their desire to win back the league title that they lost to Kerry last year and I'm optimistic that we will see a far more fluent and cohesive performance. The last couple of games have lacked the drive and running off the shoulder that you normally associate with this Dublin team and while they will be forced to be patient on occasion as they wait for a chink in Galway's defensive armour, I expect them to be more positive and sharper in how to go about breaking Galway down. By doing this at pace, Dublin should be able to expose Galway on a quick Croke Park surface that suits this approach and I'm just not convinced that Galway have the tools to derail Dublin on this occasion. I would imagine that their ambitions at present are to break into the top three or four counties in the country and they are showing positive signs of getting there. However, we just don't know whether they have a Plan B and will they have the confidence to attempt to press and expose Dublin high up the field? They really don't need a heavy defeat so close to their seismic clash against Mayo as that has the potential to undermine all the good work that they have done this year. It possibly won't be a great spectacle but you have to keep faith with a Dublin team that has dealt with these type of systems and with these type of situations in recent years. They will want to lay down a marker ahead of the championship - Dublin out in action against Offaly or Wicklow on May 26 or 27 - so Sunday's final is an ideal opportunity to do just that and I expect them to prevail by four-five points.